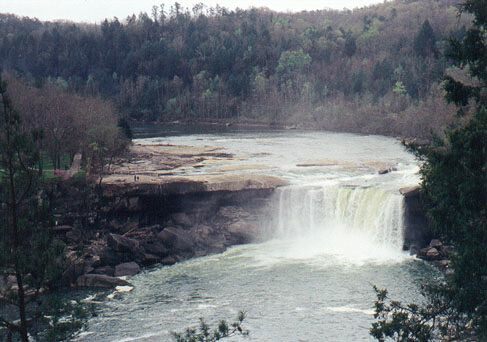 Surrounded by the Daniel Boone National Forest, the falls drop 68 feet. This is one of the only places in the world where a 'moonbow' appears around the night of the full moon. Originally called the Shawnee River on French maps dating back to 1650, it was renamed in honor of the wicked Duke of Cumberland by Dr. Thomas Walker in 1750. The first record of white men on the Cumberland comes from 1780 when Zacheriah Green and a party of longhunters on a raft made of poplar trees were exploring the territory by means of the river. On February 12th, they floated down the canyon, looking up at huge icicles hanging from the rock walls of the gorge when they heard a rumbling sound ahead. As the craft accelerated and drifted toward the mist, the men began to pole the raft toward the shore. Once they checked out the falls, they considered their options. The boat was too heavy to portage. Finally, one man poled it back out to the middle of the river, jumped overboard and swam ashore while the boat was carried over the falls. Miraculously, it emerged from the lower pool still in one piece. The aware and cognizant continuity of consciousness originates and occurs without interruption, the next moment resulting from the previous, just as one progresses steadily when training in reading and other things. How, then, can it be discontinued at the time of death, while its own perpetuating causes are still present? This is like the example of a flawless seed possessing the conditions such as earth and water, or like the continuous flow of a great river. Before we were born we had no feeling; we were one with the universe. This is called "mind only," or "essence of mind," or "big mind." After we are separated by birth from this oneness, as the water falling from the waterfall is separated by the wind and rocks, then we have feeling. You have difficulty because you have feeling. You attach to the feeling you have without knowing just how this kind of feeling is created. When you do not realize that you are one with the river, or one with the universe, you have fear. Whether it is separated into drops or not, water is water. Our life and death are the same thing. When we realize this fact we have no fear of death anymore, and we have no actual difficulty in life. When the water returns to its original oneness with the river, it no longer has any individual feeling to it; it resumes its own nature, and finds composure. How very glad the water must be to come back to the original river! If this is so, what feeling will we have when we die?